Kitchen Classics Spring Newsletter brings the latest news from your source for single family and multi family kitchens, baths, laundry and mud room amenities, bookcases, libraries, common areas, fitness rooms and more. We are a single source for kitchen and bath needs from design to installation. We are fortunate to work with clients looking to renovate their existing kitchen, often from the ground up. We have recently completed two wonderful projects with two great homeowners. These projects are the first to appear on our new web page "Just Finished" which can be viewed here. Renovations offer unique creative opportunities which we embrace. Often the client knows exactly what is wrong with their existing kitchen but is unsure if and how it can be corrected. Clients are often surprised at how cabinetry and storage solutions have progressed recently and the creative ways age old problems are now addressed. The technology, materials, appliances and installation techniques today allow us to craft solutions and create new, more functional kitchens. Kitchen Classics and our sister company, E&F Contractors, work with multi-family developers throughout the mid-atlantic and northeastern United States. We are actively working in 5 states right now and and have completed work in 3 other states. We have the management structure, personnel and resources to assure that our high standards are met wherever we work. With so much of our multi-family business being with repeat customers we appreciate the trust that these development companies place in us. Through our kitchen, bath, and common area services to our door and millwork fulfillment services we are responsible for many of the most vital spaces in very expensive developments, and we work hard every day to assure that our standards are met as well as our timelines. We particularly appreciate working with so many high quality developers and construction firms. We realize that for our customers creating communities that residents love is the primary goal, and we are proud to be part of so many quality multi-family projects. 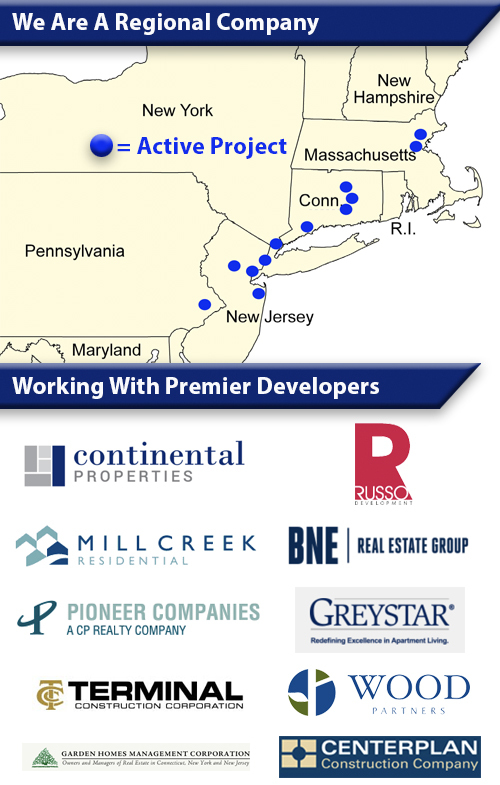 To learn more about our multi-state, multi-family capabilities please contact Bill Welker at 908-964-7101.